As an eldercare Clinical Social Worker, I have worked with individuals who are living with dementia and those caring for them for over 35 years. Midway through my career, my mother was diagnosed with probable Alzheimer’s at age 71. My mother lived with Alzheimer’s disease for 17 years, she died at 87 years old. Throughout this journey, I wanted to find ways to stay positively connected to her. As mom’s dementia progressed, she had to move into assisted living, and then later a nursing home. I soon realized that spending time together without a specific plan was often unpleasant for us both. Meaningful engagement was up to me! I had to step back, and be mindful of her strengths and abilities and continually adapt to where she was cognitively, emotionally and physically. Instead of thinking about her condition in “doom and gloom” terms, I became determined to find positive ways we could spend time together. At first this took me out of my comfort zone. I was more of a serious person and one that was not usually spontaneous. But all that quickly changed when I realized that my mother loved to dance and sing at a moment’s notice. So, when I did that with her, it turned out to be a lot of fun for us both! It also helped me get more in touch with the silly side of myself. Most of my visits involved some sort of activity that we could engage in together. I bought a CD player and brought the music of her favorite singers and musicians. We watched the “Golden Girls” and “I Love Lucy” episodes, laughing ourselves silly. I brought an electric skillet and would cook up snacks for her. Before too long, other residents would come by and join in on the fun! In the summertime, I would bring a picnic lunch and we would sit outside. I also brought my blender and made fruit smoothies or her favorite, chocolate milk shakes. When it became more difficult for mom to communicate I came up with the idea of a “spa day.” I got permission from the hair stylist to bring mom into the hair salon in the nursing home. I made a big deal out of it, telling her it was her special “day.” I washed her hair, washed her face with nice smelling soap and then completed her experience with massaging lavender lotion on her face, hands and arms. Other times, I would clean her nails and then polish them for her. She loved this special attention and it made me feel happy to do this for her. In addition to the different ways I visited with mom, it was important for me to give her every opportunity to “still be my mother.” I continued to share with her what was going on in my life, in the same loving spirit we have always shared with each other. I will never forget my experience when I told my mother, (who was already in a nursing home) that her ex-husband, my father, had died. They had been married for 21 years and divorced for over 20 years by this time. I wanted to share this news with her, as I felt rather sad and was hoping to receive some comfort from her. Well, when I shared that he had died, she looked at me, hesitated and then a few minutes later she replied, “Good for him!” I was stunned. At first, I didn’t know what to say. Then I said to her with tears in my eyes, “But mom, he was my father and I feel sad.” Next thing I knew while sitting in her wheelchair she reached out with both of her arms to offer me a hug and comfort. I went right into her arms and cried. Had I not given her this opportunity to be my mother I would not have had this touching experience. I also think back to the end of her life, when mom was mostly in her bed. Sometimes I would sit by her side and read to her. But the most special times were when I decided to get in bed with her! We would lie side by side and I would sing to her. It reminded me of the times that mom would crawl in bed with me when I was a young child and she would sing to me or read me stories. These experiences and many more like them, encouraged me to begin sharing my experience with my mother, with my clients, hoping it might be helpful to them. Over the years, my clients have often shared that finding ways to connect with their loved ones who had dementia was difficult and frustrating. I began helping them come up with engagement ideas so their time together was more positive. My passion for spending more meaningful time with my mother and my concern for my clients led me to write my new book for care partners, Meaningful Connections: Positive Ways to Be Together When a Loved One Has Dementia. While this book was primarily written for family care partners, it can also be helpful to professional caregivers, especially those who work in home care. Meaningful Connections: Positive Ways to Be Together When a Loved One Has Dementia, introduces care partners to person-centered activities and meaningful engagement ideas. A Dementia Abilities Continuum was developed as a tool to help care partners assess where their loved one might be cognitively so they can find activities they can enjoy together. There are a variety of activity categories that care partners can choose from, with an ideas section, questions to discuss section and items to consider. At the end of each activity category are ways to adapt the activity based on the Dementia Abilities Continuum. There are short chapters on visiting tips, honoring care partner’s own feelings and how to visit at end of life. I also introduce Grab & Go Activity boxes, which are a theme related collection of items that care partners and others can use when visiting. Each box can be tailored to your loved one’s interests and contain objects related to a past interests or passions. Appendix A provides four examples of Grab & Go Activity Boxes, how to use them and what items can be placed in them. These boxes are great ways for children to become involved. They can also help grandchildren have more successful visits with their grandparent, aunt or uncle who has dementia. Lastly, Appendix B provides a list of activity programs and resources. All people need meaningful engagement to keep their mind, body and spirit alive and well. We all yearn to feel connected to people and the world around us. Meaningful engagement starts with us, the care partners. We need to be willing to “let go of” the ways we used to connect and find new ways of being together. 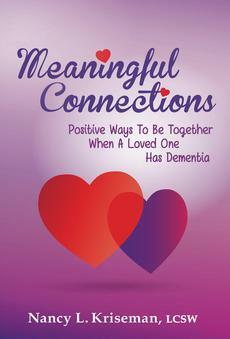 My hope is that my book, Meaningful Connections will be a resource that can help care partners find positive ways to be together when a loved one who has dementia.